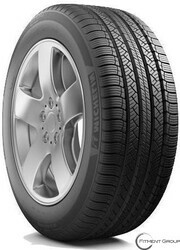 The Michelin Latitude HP Tour is a touring all season light truck tire. The Latitude HP Tour was created for the drivers of premium crossover and sport utility vehicles. Michelin’s Latitude HP Tour tires are created to combine comfort, handling and all-season traction, even in light snow. The Latitude HP Tour features an all-season tread compound and balances dry, wet and wintertime traction. The Latitude HP Tour has stable shoulder blocks and a continuous center rib enhance responsiveness and provide stability. The Latitude HP Tour also features wide circumferential grooves that help reduce hydroplaning and sipes that enhance handling in rain and snow. The Latitude HP Tour tire's internal structure features twin steel belts reinforced with Michelin FAZ Technology that winds polyester and nylon cords spirally under the tread area to promote a stable feel and excellent steering. The Michelin Latitude HP Tour also has polyester cord reinforced sidewalls that enhance ride quality.